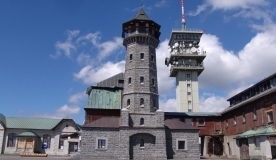 Boží Dar with its altitude of 1028 metres above sea level is the highest town in Central Europe. The name “Boží Dar” is supposedly derived from the statement of the Saxon Elector Johann Friedrich, who, when being offered a seat from a single piece of silver, said: "Dieses edle Metall, das ist euer Brot, das ist eine Gabe Gottes" (“This noble metal is your bread. That is the gift of God”). Whatsoever, a long history had preceded that moment. The surroundings of Boží Dar began to form as early as in the Palaeozoic era, when a not very high mountain range stretched out in place of the whole Ore Mountains geological system. In late Palaeozoic during the Variscan orogeny, deep igneous granite began to penetrate the surface and the Ore Mountains started to rise slowly. These igneous rocks were bound to many significant deposits of tin, tungsten, silver, lead, zinc, nickel, cobalt, bismuth, uranium, arsenic, and copper. During the Tertiary, a massive effusion of volcanic basalt occurred not far from where now Boží Dar is. Thus the Špičák peak, which is the highest basalt hill of volcanic origin in Central Europe with its 1115 m.a.s.l., was formed. Later in the Holocene, Boží Dar peat bog started to come into existence on the adjoining tectonic disturbance in the place where deep underground springs bubbled up. However, Boží Dar region had to still wait for the arrival of its first settlers for a long time. Even at the beginning of the 16th century, the surroundings of Boží Dar were covered by a dense alpine forest. For his loyalty and support of the Roman Empire, the land around Boží Dar was given to the Czech king Přemysl Otakar I. by the Roman Emperor Friedrich II. Since then, this land is considered a Czech feud. In 1424, this land was gained by Czech noble family Tetour from Tetov. After the death of Jiří Vilém of Tetov, the land around Boží Dar became the property of Jiří z Poděbrad (George of Poděbrady). That was until 1459 when his daughter brought it as a dowry to Saxon elector Albrecht. Boží Dar was thus incorporated into the Saxon territory even though the Boží Dar area was generally seen as a poor land where not even logging paid off. The quarrels over the state border location started at the turn of the 16th century when nuggets of silver and tin were being coincidentally found in alluvial sediments in rivers and brooks. These disputes escalated in summer 1528 when the miner Hans Schramm working for rich owner of a hammer mill Kleinhempel striked silver at the western foot of the Fichtelberg mountain, in the place where estates of the Šlik Earles, Lords of Schneeberg, and Lords of Tetov were bordering. The findings of silver were apparently very promising and in 1529 the Saxon Elector Johann Friedrich, in order to support mining activities, declared the so-called freedom of mining for the part of the Schwarzenberg estates which bordered with Jáchymov. Not even a year later, the Boží Dar district took up the area bounded by the old road to Loučná. From there, the border line continued to the so-called Riegel in the highland between Boží Dar and Jáchymov, to the peak Špičák near Boží Dar and further north from Hřebečná to the old Hengst, Bludná, Ries above Mrtvý potok (Dead Brook) to Háje and Rozhraní. In the north, Boží Dar territory bordered with the Hartenstein estates, and with the Šlik dependencies in the south. The endless border disputes in this region were ended up by the Saxon Elector Johan Friedrich, who in 1533 signed a purchase agreement with the heirs of Tetov House and took this estate in his ownership. Even though, Boží Dar stayed a part of the Saxon territory through this act, the Czech currency was still authorised to be used in here. In the summer of the same year, the borders of a new urban unit on the plateau were demarcated by the Saxon Elector’s order and 600 new building plots were admeasured. The settlement of Boží Dar is dated to the beginning of the 16th century when mining prospectors started to move into these highest areas of the Ore Mountains, first from the Saxon part from Fichtelberg and a bit later also from Jáchymov side. The year 1546 was crucial for Boží Dar. On 6 July 1546, the Elector Johann Friedrich gave Boží Dar the privilege of free mining town. Until this time, it had fallen under the mining district office in Schneeberg. This privilege gave the burghers of Boží Dar the right to vote 12 town councillors who elected the mayor among them. Furthermore, he founded a parish church and gave burghers the right to trade and crafts, as well as the right to a weekly market on Friday of each week and an annual market of St. Nicholas. In autumn in Germany, the so-called Schmalkaldic War broke out and, because of the prevailing disagreements between the German Emperor and Elector of Saxony, Boží Dar was on 23 October 1546 occupied by soldiers of Bohuslav of Lobkowicz. On the arrival of the imperial army, the residents mostly escaped to the surrounding forests and the town became almost completely depopulated. The Elector Johann Friedrich was defeated and captured next year at the Battle of Mühlberg. But even before that defeat on the battlefield, his cousin Maurice, Elector of Saxony, had concluded a secret agreement with the Bohemian and Hungarian King Ferdinand I. Habsburg on 14 October 1546, in Prague, according to which half of the Schwarzenberg estates with the towns Boží Dar and and Horní Blatná fell back to the Bohemian kingdom. The constant claiming of ownership to the ore-rich and strategic border territory near Boží Dar was finally resolved on October 26, 1556, when the Schneeberg Agreement was concluded between the Czech state and Saxon Electorate which determined the exact line of the state borders of both states. Two years later, in the summer of 1558, based on the Schneeberg Agreement, the state border was outlined by border milestones. In the 16th century, along with silver and peat mining, which focused especially south-east from the town, the panning for tin in the watershed of Černý potok (Black Brook) and mining around Zlatý kopec (Golden Hill) started. Nevertheless, already since 1574, some records has been preserved reporting that mining of some ores had to be sponsored. After the Thirty Years War (1618-1648), the mining focused more on arsenic and tin mining which had not been as unprofitable as mining the other metals. The subsequent religious Counter-Reformation resulted in partial depopulating of the town which also led to reducing the mining activities. On 25 July 1608, Rudolf II. Habsburg, the Holy Roman Emperor and Bohemian King in Prague, confirmed the burghers of the mining town Boží Dar the existing privileges, mining law, municipal court law, the right to trade and crafts (the salt trade, brewing), and the right to an annual market of St. Juda and Simon (28 October). In 1743, an attempt was made to restore mining in the main Boží Dar silver vein, success, however, was only temporary. On 7 August 1795 in Vienna, the Emperor Francis II. Habsburg confirmed all the municipal rights and freedoms of the Boží Dar citizens that they had received since 1546. The definitive termination of mining activities in the area of Boží Dar came in 1820. In the second half of the 19th century, the only profitable source of living was the bobbin lace making. Bobbin lace making, however, was only a short matter of fashion and so many people were leaving to work abroad or earned their living as wandering musicians. After World War II, Boží Dar became almost a deserted town. The situation improved after 1971, when a border crossing to East Germany was opened near the village. Since the 16th century, the importance of Boží Dar changed substantially and from the medieval vibrant mining town with 2,000 inhabitants, Boží Dar has become an important tourist centre of winter and summer sports in the 20th century. In the town, you can find a church building dedicated to St. Anne. This baroque church with attributes of classicism was built in 1772 by Filip Heger on the site of the demolished Renaissance building from 1593. A tin baptismal font displayed inside the church is well worth mentioning. This baptismal font was made by a black smith and bell-founder from Jáchymov Hans Wildt Sr. The centre of the town is formed by a Renaissance square of rectangular shape into whose corners a pair of streets always leads. The dominant building of the square is the town hall built in 1844-1845 in the style of late classicism. Other older buildings in the town were destroyed by fire in the 1808. In the local cemetery, a Boží Dar native, singer and self-taught poet Anton Günther (1876–1937) is buried. The Greek writer Nikos Kazantzakis, who lived in Boží Dar in 1929 – 1931, is another important figure.